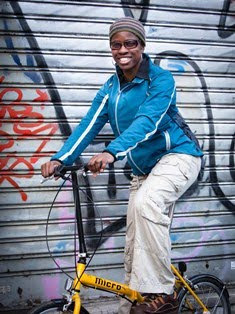 2Wheel Chick: In the Land of Beer, Merckx and Cobbles !! So the train pulled in at Brussels, and shortly afterwards we were on a local train to Haaltert, near Aalst. Once we were off the train we just needed a few minutes to remove our bikes from the bags, assemble them and start the short trundle over to the Ibis Hotel, Aalst. We couldn't have asked for a more seamless journey ! Him Indoors wasn't feeling too good, and the original plan had been for him to get lots of rest ahead of the big day. However, the weather was so lovely under the bright sunshine, and it seemed a shame to spend all day in the hotel room. So we decided to do a "short" ride to Geraadsbergen, and recce the last 2 bergs - the Bosberg, and the infamous Muur. Riding through the Flanders plains seemed so effortless. There were special cycle paths for us to ride in, and specific cycle lanes at junctions with traffic lights for cycles - not just a cursory affair with cars parked along it, like you get in London. Furthermore, the terrain was pan flat - which made it hard for me to believe that we really were going to be riding up 2 climbs, never mind 18 ! In fact it was too flat - at moments it was like staring into miles and miles of emptiness. This was the epitome of bland. Surely someone could have stuck just one hill in there to spice the view up a little ! Then we arrived in Geraadsbergen. Famous last words - the road gradually began to elevate, as the cobbles became more and more consistent. There was also a growing buzz in the air as we reached the main square. Lots of bicycle bunting, music, and cyclists hanging around in anticipation of something eventful. Some pro cyclists from the Liquigas Team even rode by, fitting in their last minute preparations. Once in the main square we didn't need to look hard to find the Muur. Lots of signs showed which way to go, and many cyclists were going that way. I began to feel a sense of nervousness. I remembered the words of a local man we chatted to at the hotel about the Ronde van Vlaanderen. "You won't get up the Muur - or at least not the first time you try it. Maybe the second or third time." I could feel the ground getting steeper and bumpier as I prepared myself for a painful moment. I ground away in my lowest 32 x 27 gearing, as I rounded the corner and the gradient rose to 20%. Passers-by cheered me on as I heaved and panted, determined to give it my best shot. Thankfully the road levelled off, and I was able to take a breather before tackling the final 13% ramp. Being able to see the Chapel, which marked the end, and the encouragement from drinkers at the nearby pub, gave me the strength to go for it. 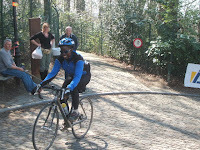 I made it up the Muur on my first attempt. Wow !! I was so pleased I'd done it. This had emboldened me and given me confidence. I even did it again. This time with a harder gear. Recce-ing the hardest part of the ride certainly made me feel excited about doing the cyclosportive and all the other bergs. I was actually looking forward to the next day ! After hanging back to chat with other cyclists, and taking photos etc we then headed homewards via Bosberg (piece of cake) and Ninove (the start town) where we stopped to carbo-load with a plate of spaghetti. Our "short" bike ride ended up being a long day. 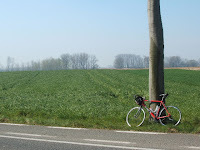 We did 60km and alot of meandering around, what with taking phots, riding the Muur a few times, and trying to find a cash machine that actually worked (!!). When we returned to Aalst we wound things down in preparation for the big day to come. Him Indoors was beginning to feel that bit worse, and realised he might have overdone things. We had an early night.